Remotely review flashcards with Anki. 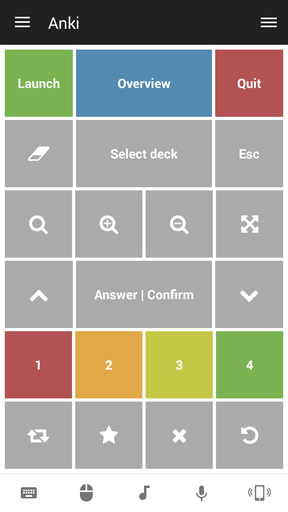 A simple custom remote for the spaced repetition flashcard app Anki. Review cards while on a treadmill or across the room! The following features require the Zoom and Toggle Full Screen add-ons for Anki to be installed. Please note that – due to key assignment changes – some of the features in this remote might not work with Anki 2.1. Unfortunately there is no good way to detect which version of Anki is running. As soon as 2.1 overtakes 2.0 in general use I will be updating the remote to reflect the new hotkey assignments. This project is licensed under the GNU GPLv3. The icon is based on 'Anki icon for Faenza' by jesuisbenjamin; released under the CC BY-NC-SA 3.0 license. Each and every contribution is greatly appreciated and will help me keep working on my projects!